The Sisters of Perpetual Adoration celebrated their centenary in 1974. They had been founded in 1874 by Fr Julian Edmund Tension Woods and settled in South Brisbane. Their first superior and co-founder, Sr M Stanislaus (Catherine Gaffney), was inspired to join the new institute after hearing a sermon preached by Fr Julian in Tasmania. 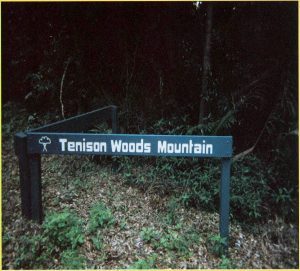 To perpetuate the memory of their founder (and co-founder of the Sisters of Saint Joseph of the Sacred Heart) an unnamed mountain crest on the D’Aguilar Range in the Mount Glorious area of Queensland was named the Tenison Woods Mountain. This peak is the highest point of the range at 770 metres above sea level. 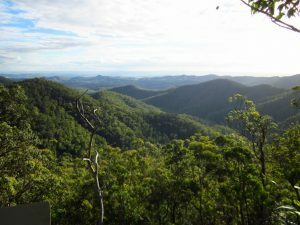 It is at the junction of Kobble Creek Divide and the Mt Samson Range and approximately 50 kilometres north west of Brisbane. The official naming ceremony, on Sunday, 09 June 1974, was attended by many dignitaries, including the Mother General, Mother M Rosarii, Fr TP Boland (author of the book Quiet Women launched for the Centenary), and members of Fr Julian’s family from South Australia. Honourable W A R Rae MLA, the then Minister for Lands and Forestry, spoke eloquently about Fr Julian’s achievements, and the Right Reverend Monsignor Grantley Lake OBE celebrated the blessing ceremony. Mr Rae unveiled a plaque on the mountain top naming the Tenison Woods Mountain after Reverend Father Julian Edmund Tenison Woods FLS FPS FGS FRGS. This plaque commemorates his scientific contributions to Queensland, and acknowledges Father as founder of the Congregation of the Sisters of Perpetual Adoration.